Buschman first developed grooved metering rods in 1977 and today is the global leader in grooved rod engineering and manufacturing. Threads can be created to conform to many profiles and customized to optimize the coating process, thus allowing for more precise and cost-effective metering than that of wire-wound rods. The unmatched precision of Buschman’s grooved metering rods ensures consistent quality, stability, and long rod life. Our grooved metering rods are rollformed using the finest stainless steel for the most demanding applications. Thread profiles are custom-engineered for your machines and coating applications. Buschman dies are the most accurate in the world, to tolerances of millionths of an inch. Our proprietary in-house manufacturing process renders a superior grooved coating rod that consistently performs to perfection, even for coatings with a high percentage of solids. 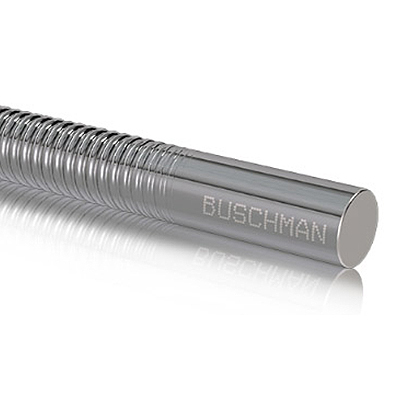 Buschman offers more than 28+ thread profiles, the most of any supplier in the industry. Our engineers can create a customized thread profile specifically for your application, optimized for superior performance and reduced costs in your coating operation.